Your location will have had a big impact to your harvest outcome this year. Weather issues stressed crops across the Prairies. Whether you had a bumper crop or a poor crop, you need to review your marketing plan. This is the critical time when prices and trends can be set for the better part of the next year. You need to know how the markets are trending so you can make informed decisions about how and when to market your grains. The first thing to review is your actual production costs and yields. This will help you determine your break even numbers so you know what price you need to cover your costs and, hopefully, turn a profit. Then, you need to get a good idea of the quality of crops that have been grown in your marketing area, so you can determine if you’ll be able to sell your grains for a quality premium. If your quality is the same as the majority of the grains in your area, you’ll be competing against everyone else. Talk to neighbours and buyers to get this local information. You will also need an understanding of the overall harvest across the Prairies and the U.S. What is the production and quality potential? This will set the tone for prices for the next six to 12 months, because prices for Prairie grains are influenced by U.S. grains futures markets. North American crops can have significant impact on world markets because together U.S. and Canadian grain exports are a large part of total world trade. Look for Statistics Canada and United States Department of Agriculture reports and other market information updates and newsletters for this information. Next, a good understanding of world markets is critical in helping you decide when you should sell your grains. How are the crops in other parts of the world? What about major importing regions like China, India, Malaysia, Japan and the Middle East? If their crops are good they won’t buy as aggressively as they may have otherwise. How are crops in major exporting regions like the U.S., Australia, the Baltic Region, the EU and South America? Big crops in these regions mean more competition and likely lower prices. Poor crops or quality may provide us with additional sales opportunities and possibly higher prices. Look for the USDA and World Agricultural Supply and Demand Estimates (WASDE) and other independent reports. Early harvest yields for peas and malt barley are above average, as is the quality. This will make buyers very comfortable, which will likely start to push local prices lower. Wheat harvest volumes across the Prairies are very inconsistent. The U.S. wheat crop is the lowest acreage in over 30 years, but the Russian and Australian crops are reported to be above average for production and with decent quality overall. If you add that to the large carryover from last year, the world continues to have excess stocks that are going to keep world prices under pressure for at least the next year or maybe longer, depending on future wheat crops elsewhere in the world. Canola yields are above average and the U.S. bean crop is estimated to be above average. North American oilseed markets are well supplied. South American bean crops are also reported to be above average which means world buyers will have more than adequate inventories and suppliers to choose from. Previous-year ending canola inventories were tight. If crush demand remains similar to last year, supplies will be adequate to meet demand but it is likely that ending inventories will remain tight at the end of next year. This should help keep prices steady if the Canadian dollar remains in the $0.75 to $0.80 range for the next year. Other things to consider are your storage capabilities, your farm cash flow needs and local market demand. 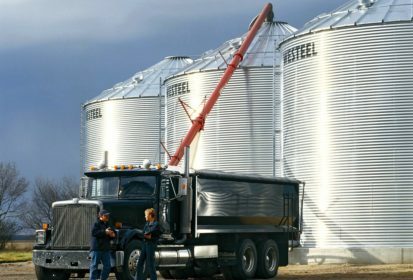 If you decide to hold your grain and sell it later, can you maintain quality in the bin for several months? Do you need cash flow to pay bills and or pre-buy supplies? Are local buyers offering short-term premiums for specific grains? Should you sell to them or not? Review your numbers, gather market information, make your marketing decisions and act on them. Then be ready to do it all over again because market conditions are always changing.